Start your free application now and get an online decision in as little as a few minutes. Redeem points for 1% cash back, merchandise, travel, gift cards, and much more. Request an increase in your credit line and receive your increase in as few as 24 hours. Start establishing your credit history with the Visa FIRST Credit Card. Borrow from lenders with better rates and terms by establishing good credit early. Your Memberperks Rewards Card comes with no annual fee. Earn 1 point for every $1 spent redeemable for travel, merchandise, 1% cash back, and much more. Earn 5x points, 3x points, and up to 50% off daily deals from select online stores. 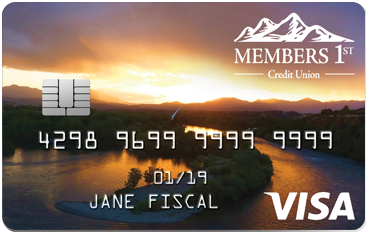 Purchase a rental vehicle with your Members 1st Visa Classic credit card for added security. Received reimbursement for any damages due to collision or theft up to the actual cash value of most rental vehicles. Learn more about the auto rental collision damage waiver. Enjoy 24/7 phone support for Visa specific card enhancements. Learn more about the cardholder inquiry services. Your monthly spending of $ will earn you annually $ cash back or redeemable points. Maximum initial credit limit of $1,000. Employed with current employer for a minimum of 18 months. Provide current proof of income and residency. Protect yourself and your family from unexpected life events. Receive credit card payment assistance and/or forgiveness with a Wealth Protection plan from Members 1st.